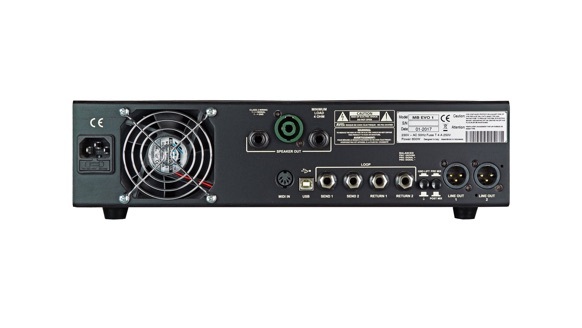 •Pre-owned 500w amplifier in immaculate condition with optional footswitch, boxed. The Markbass EVO 1 is a rEVOlutionary amp, as a result of the mix between classic and advanced technology evolution to allow bassists to have not only just a gorgeous bass sound, but always the right sound - no matter which genre and technique they're playing. The Markbass EVO 1 offers six amp tone choice for each of the two channels, clean and distorted. One of the most common tricks to get a cutting in the mix sound, or nail a good distorted sound for a bassist is usually to run two signals at the same time: a clean tone and distorted tone. 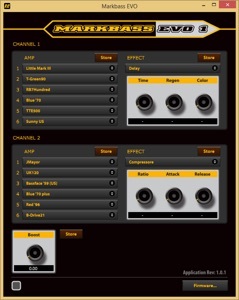 The two channels and mix control allow you to do that easily and efficiently. The EVO 1 also features separate EQ settings for both channels/amps, classic standard controls, one effects for each channel, MIDI ports, on-board tuner, aux input, headphone output, FX loops, XLR line outputs and a powerful 500 watt Mark Proprietary Technology power amp. All amps and effects can be downloaded and updated from the Markbass website. You can update AMPs choices on each channel at your preference thanks to the MARKBASS EVO 1 SOFTWARE, that also allows to update FX choices for each channel and customize their parameters, plus you can set the Boost level that can be switched on/off via MIDI. The optional MB EVO 1 CONTROLLER allows to switch between CH1 and CH2, turn on/off the REV1, REV2 and BOOST, plus accessing the TUNER with MUTE function pressing and holding the boost switch. The EVO 1 can be controlled also via programmable MIDI pedalboard. 100V; 120V; 230V; 240V 50/60Hz (Voltage is factory preset according to region of sale). Markbass amps/combos are manufactured to be sold and used in the country of purchase, and are factory preset to that country’s voltage. Due to homologation issues, the voltage may not be changed.